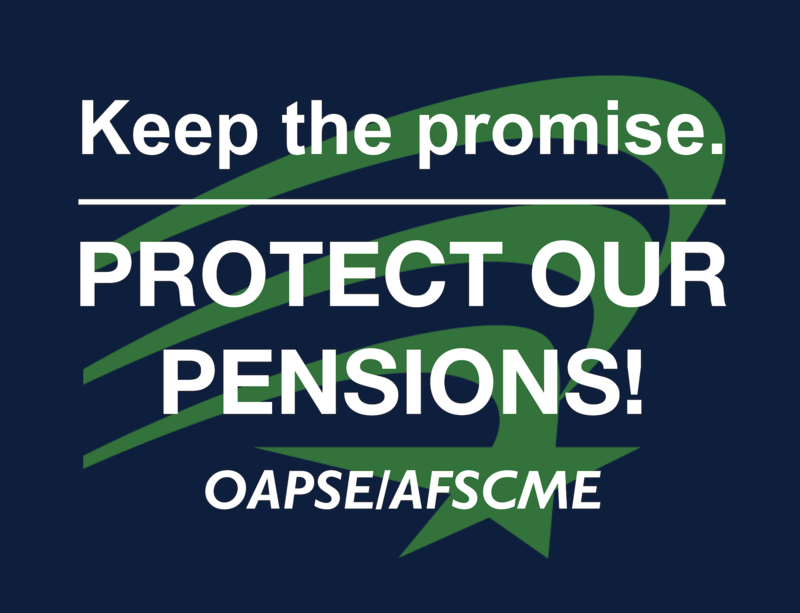 OAPSE leaders are vowing to fight back and keep the pressure on administrators at the School Employees Retirement System (SERS) after the Ohio Legislature and Governor Kasich acted to cut and freeze retirement benefits for OAPSE members and retirees. The cuts and freezes were recommended by the administrators at SERS. Unfortunately, instead of taking up that language in a stand-alone bill, lawmakers opted to sneak the SERS language into the 5,000-page biennial state budget. The budget bill was signed by the governor on June 30. As a result, SERS will have the ability to enact cuts and freezes to cost of living increases (COLAs) for retirees in the pension system. SERS is set to take that action this fall, so cuts and freezes in COLAs can go into effect January 1, 2018. Hundreds of OAPSE members and retirees marched on the statehouse and on the SERS building on June 7 with the message, “Keep the Promise. Protect our Pensions!” They gathered to protest the cuts and freezes and to ask legislators and SERS administrators to consider other options to boost the retirement system’s bottom line. Rugola reminded the June 7 crowd that for more than 20 years, OAPSE has been encouraging SERS administrators to focus on providing long-term benefits to long-term school employees. “We have been talking with SERS for years about the need to take care of our members who have worked 25, 30, 35 and even more than 40 years in our schools. These are the people who have given their whole lives and careers to helping improve the lives of our public school children. They should not be targeted with reduced pensions after decades of public service,” Rugola said. OAPSE members make on average about $24,000 per year, and have retirement benefits of less than $1,200 per month, according to SERS. Randy Weston, OAPSE director of political action and legislative affairs, said it is especially disturbing that the Republicans in the legislature buried the COLA language in a huge, complicated budget bill instead of having the guts to pass a stand-alone bill. “Our members marched on the statehouse, and State Vice President Lois Carson testified before the House Committee on Aging and Long-term Care to make sure legislators knew this language would really harm our retirees who are counting on a COLA to make ends meet,” Weston said. He said all but one Democratic lawmaker supported OAPSE members and voted against the budget bill. “We had very strong and public support for OAPSE members and retirees from State Representative Kathleen Clyde (D-Kent), State Representative Dan Ramos (D-Lorain) and State Senator Cecil Thomas (D-Cincinnati), who were with us at our June 7 march and voted against this budget bill,” Weston said. He stressed that this budget vote is a great example of the fact that elections matter. “With a Republican-controlled legislature and a Republican governor, this was an uphill battle because working families are not represented in the numbers we need to have their voices matter. This underscores the importance of the governor’s race in 2018,” Weston said. Rugola said the union will continue the fight to protect the retirement security of OAPSE members. “Our emphasis now will be on making sure SERS understands that it is not fair to ask long-term public school workers and retirees to shoulder the burden of solving a funding problem they did not create. This is asking too much of us. We hope that the leaders at SERS will explore other options. We want to work with SERS to come up with creative alternatives that do not penalize retirees who count on their COLAs to survive,” he said. Watch your email inbox and check www.oapse.org for important updates about how you can join the fight for fair pensions.